Settling down and having kids does not mean you can’t enjoy a day of immersive adventure. Our Tet Paul Nature Trail Hike will open up the world of St Lucia adventure for kids allowing them to experience Saint Lucia at its most breathtaking. Hiking the trail is always new and exciting when you’re a child. Bring along the family and discover things for the first time all over again. There are a few travelers who opt to do their own driving to the Gros Piton Mountain Trail. Many love to be truly at their own pace or just love the adventure of complete immersion. Often the case, we receive inquiries from many travelers concerning the direction one should take. while the route is quite easy for locals to find, tourist sometimes have a hard time navigating our complicated maps. Real St.Lucia Tours have created a video detailing the direction to trail. This will now make it easy for our many adventurers to find upon arriving in the town of Soufriere. Dreaming about that perfect Saint Lucia vacation? Maybe one that would allow you to relax and experience the sights and sounds of nature and unique culture you are immersed in. With a villa rental in St. Lucia you can make this a reality and begin making plans for that vacation you've always fantasized about. The reasons to book a vacation rental over hotels are numerous. One reason for taking a holiday is the ability to relax, enjoy yourself and let go. Enjoying yourself in a tiny hotel room is next to impossible, unless that’s really your thing! Have a wife and 3 or 2 adorable children? Is it possible for your family to comfortably share a little room in an environment full of strangers for a month? Such an experience doesn’t sound like a once in a lifetime memory at all. A villa rental in St. lucia will allow you, your family and friends the opportunity to spread relax and be on island time as the locals love to say while having all the amenities and comforts of home while on island. beyond that, if a vacation rental is something you fancy to do over you have the option of renting it again and again. Island villa escape rentals in Saint Lucia is your chance to create that indelible experience of a lifetime. With luxury priced at budget prices it’s easy to say you won’t be breaking the bank while still being able to experience the vacation you’ve only dreamt about. The island of St Lucia is a fantastic destination for the adventurous spirit. With volcanic pools to bathe in, mountains to climb and an underwater world to explore, the intrepid traveller will never be bored here. If you want to indulge your inner Tarzan and enjoy an adrenaline rush like no other, join us for a trip to the less visited eastern side of the island for the ultimate jungle adventure. The Real St. Lucia Zipline Tour kicks off with a drive to the fishing town of Dennery, about 40 minutes from Castries. Dennery lies at the mouth of the Dennery River. Just to the west of Dennery along the banks of the river we stop at Treetop Adventure Park, home to the Caribbean’s best zipline. Here you get to sweep through the rainforest canopy high above the ground at speeds that will take your breath away. There are 12 lines, the longest of which stretches for 800 feet through the treetops. All in all you’ll cover 5,100 thrilling feet, with the highest point a dizzying 150 feet, or about 15 storeys, above solid ground. Protective gear, including harnesses, a helmet and gloves, are provided. Trained guides will be with you on every platform to ensure that you have an unforgettable but, above all, safe experience. During the adventure, you can admire the rainforest of St Lucia from a different angle and maybe even spot birds, reptiles, insects and arachnids that you wouldn’t otherwise have seen. Afterwards, you may want to see the forest in a more traditional way, which you get to do as we drive the short distance to Errand Falls, also known as Dennery Falls or Sault Falls. With a drop of about 55 feet, they’re among the island’s highest waterfalls. Instead of simply admiring the falls from afar, take a dip in the pool and let the cascading water massage your shoulders while you find respite from the tropical heat. After a refreshing swim, our knowledgeable staff at Real St Lucia Tours will take you back to Castries, giving you the opportunity to admire the scenic beauty of the island’s banana plantations and rainforests along the way. We drop you off at your hotel or cruise ship, where you can decide how to continue your St Lucia adventure. The entire tour lasts for about 4 hours, making it the perfect choice for a St. Lucia shore excursion or a morning out during a vacation. You don’t have to be a super fit and agile monkey to enjoy the ziplines but you shouldn’t be a complete couch potato either. The lines are not recommended for people with mobility issues, a heart condition or who are pregnant. You shouldn’t weigh more than 250 pounds. There is a minimum height requirement of 50 inches but this doesn’t mean that small children can’t enjoy the zipline adventure too. There is a special mini-zipline for children older than 3 years. It’s recommended that you wear comfortable clothes with trainers or closed sandals. Flip-flops aren’t allowed on the ziplines. Remember to bring your bathing suit for the swim at the Errand Falls! We were thrilled that we chose Janus' St Lucia airport shuttle. They were very professional and were less expensive than the competition. Additionally, we felt that we got much more than just a ride from the airport, we really got a personal tour of the island. I would absolutely recommend Janus' St Lucia airport shuttle to anyone travelling to St Lucia. More St. Lucia Airport transportation reviews from our very happy travel family. Thank you again for helping to arrange our transportation to the airport. Our driver was excellent. Very friendly, knowledgeable about the island, and pleasant company. I could not have been more satisfied with the service. I will certainly recommend your company to any friends of mine that travel to St. Lucia. Thanks again for all your assistance. I just wanted to write to thank you and your team; Danny and Elon. From the time we were picked up at the airport by Danny to the time we were taken back to the airport on Easter Sunday to go home we fell in love with every aspect of St. Lucia. Gene and I traveled with our friends Guy Campion and Gina Goncz for the first time to St. Lucia. Danny was a delight and gave us such a wonderful taste of all St. Lucia had to offer. We laughed and talked all the way to the resort. What we thought was going to be a very long over an hour drive to our resort upon arrival turned into a wonderful sightseeing adventure as we passed so many sights that Danny knew so much about and shared with us through the trip. It went by so fast. We could not wait to spend a day traveling around the countryside to see more of the island and Danny and Elon were amazing on our day excursion to view the sites. We were so happy to get to chose where we went and how long we stayed at each point and the wonderful flair to which Danny would describe what we were seeing. We can’t thank you enough for taking care of us during our stay and creating such a wonderful memory for all of us. Even coming out on Easter Sunday, a day devoted to family, to take us back to the Hewanorra Airport for our flight home. We talked the whole way home about when we could come back to see more of St. Lucia. We have already recommended your company and Danny to those we have spoken to who plan to travel to St. Lucia. And we wouldn’t use anyone else upon our return. I hope to visit again sooner than later. Thank you and Danny and Elon for our wonderful experience. 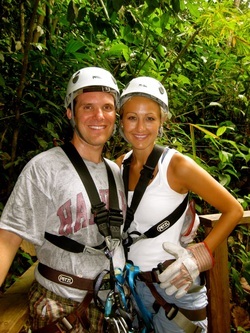 More Saint Lucia island tour reviews from our travel family. Yes we were very satisfied with our Island tour. Danny did a good job showing us around and giving us information about the island. He allowed us the time we needed at the various locations to appreciate what we were experiencing even though it ment that our tour went on a little longer than planned. 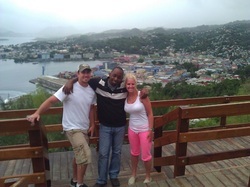 I highly recommend Real St Lucia Tours and the excellent service you provide.